If there is anything that can compete with the phenomenon of samosa in this country, it has to be the crisp and sweet jalebi. It was somewhere in the 13th century that the west Asian import made inroads into the culinary map of India, as Zolabiya, and here we are eight centuries later, absolutely hooked to our dearjalebi. Crispy, coiled and ever-so delightful jalebi, is staple across all halwais and sweetmeat shops in the country and is our all-time favourite too. Did you know that the recipe of jalebi is said to be first recorded in the 16th century, ‘Bhojana Kutuhala,‘ – one of the subcontinents first books of recipes and food science written by Raghunath. The recipe that was mentioned in the book is still practiced to prepare jalebi now. The phenomenon of jalebi is so great that people have designed several rich and coarse variants of it, as well. One of our most favourite is paneer jalebi. Much like jalebis, paneer jalebis are made in similar coiled shapes, but with fresh curd cheese. With chenna, or paneer, as the base ingredient, the jalebi is denser and richer than your regular jalebi. Layered with silver varq, topped crushed nuts and dry fruits, paneer jalebi is every foodie’s dream come true. Paneer jalebi is a popular sweetmeat across Northern states like Delhi, Uttar Pradesh and Rajasthan. Not just North, the delicacy is popular across east too and is known as channa jalebi, orchenna jilipi. Chenna, just like paneer is a milk derivative procured by curdling milk with the help of a souring, acidic agent. Chenna has been used as a base of innumerable Odiya and Bengali sweatmeats since time immemorial. Chenna jilapi is popular across West Bengal and Bangladesh, where it forms an essential part of all festive celebrations, jol-paan (snacks) and addas (local gathering). In shape and appearance, they bear a striking resemblance to pretzels, and is of a darker hue. In terms of presence across the street, there could be many reasons why paneer jalebisare not at par with regular jalebis. One of the major reasons could be its cost. Since it is richer and denser, they are not so easy on your purse strings. The process of making paneer jalebi is also slightly more time consuming and cumbersome as compared to the regular jalebi. Unlike your regular jalebis, the batter of paneer jalebi has more ingredients. Fresh chhena is thoroughly kneaded with all-purpose flour, baking powder and milk. Enough water or milk is added to make a soft dough. This dough is put into boiling hot oil in the characteristic coiled shape of a jalebi. Once fried these jalebis are placed in a sugar syrup, flavoured with the fragrant kesar(saffron) and cardamom. Due to the presence of the rising agent, the jalebis are bigger in size. The deep-fried paneer jalebis can be served hot and cold. 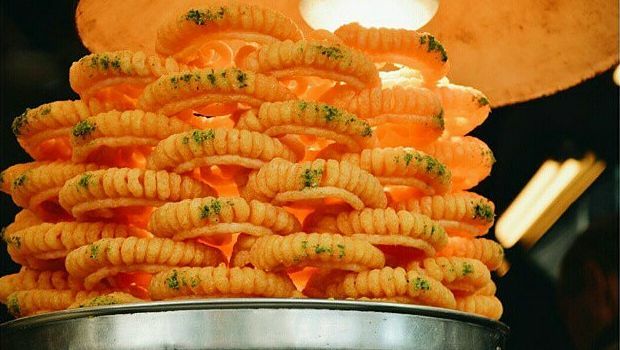 Unlike jalebis that are best enjoyed piping hot and crisp only. Now, where would you find this amazing delicacy you ask? The culinary capital of the nation – Old Delhi has some gems. Kallan Sweets, Shop No. 4 & 5, Matia Mahal Road, Opposite Jama Masjid Gate No. 1, Matia Mahal, New Delhi, Delhi 110006. Old Famous Jalebi Wala, 1795, Dariba Kalan Road, Dariba Corner, Opposite to Central Baptist Church, Chandni chowk, New Delhi, Delhi 110006. Got any more places to suggest? Mention them in the comments section below.